Minimum or no-tillage systems are often used to reduce disturbance and boost organic matter, but there are also other cultural controls which are helping to increase soil health, including the use of cover crops. To help farmers explore the options, this year’s Cereals Event (13-14 June) will see the introduction of a new Cover Crop Drilling Demonstration. 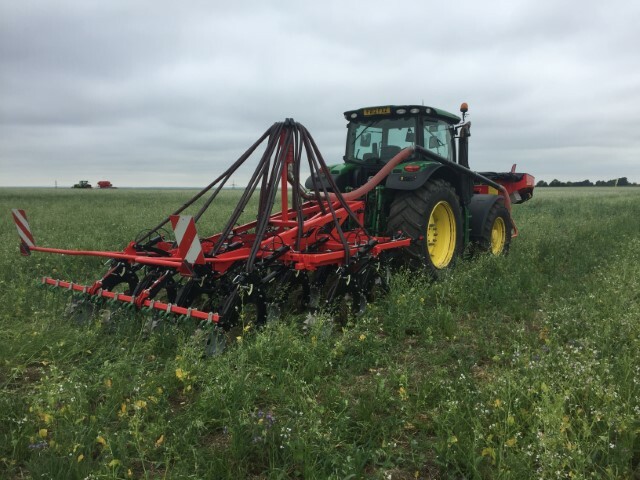 Exhibitors including Claydon Drills, Cousins of Emneth, Dale Drills, Ryetech Industrial Equipment and Sim-Tec Aitchison will demonstrate different direct drilling equipment on an 8ha area sown with a mix of cover crops provided by Kings. The cover crops being grown on-site include Siletta Nova radish; Kings’ Vitality mix of radish, cereal, vetch and clover; Kings’ Power mix comprising 40% radish and 60% oats; and Kings’ Super 10 mixture of 10 different species. Demonstrations will take place twice-daily (11am and 1pm), with exhibitors putting their latest drills through their paces as an expert explains the unique features and benefits of each machine. Drills will include Ryetech’s Ma/Ag SSP low disturbance disc drill, which has a 3-6m working width and can deliver seed only or seed and fertiliser. It has independent floating coulters with minimum 250kg pressure and individual depth control for even sowing depth across the full width of the drill. Its coulters are staggered alternately between front and back to operate effectively without risk of blocking in thick cover crops. Dale Drills will be demonstrating a 3m Eco-S seed drill, available from 3m to 5m. Mounted to the main chassis over three rows, each drilling assembly is fitted with two 12mm wide, tungsten carbide tipped tines which deliver the seed into clean soil without creating excessive soil disturbance. The tines can be spaced to provide either 12.5cm or 25cm row spacing, with the latter configuration also allowing for fertiliser to be placed alongside the seed. The Eco-S can be fitted with cover crop cutting discs – to aid drilling into thick green cover, deeper tines – to provide looser rooting zones for ‘lazy’ rooting crops and banded coulters – to give more ground cover where competition is needed for weed suppression. Simtech Aitchison will be profiling the T-Sem 300A – a 3m drill with front trash cutting discs and inverted T-slot coulters with a rear springflex roller and following chain harrow. The Fendt 313 powering the assembly will also have a front mounted vegetation roller to aid the flow of material through the drill.